You want your web site to be found? The book contains a multitude of tips that I've picked up during the last five years of designing web sites. Most of these tips have never been mentioned previously, yet they are *extremely important* to the success of your web site! I put my notes onto several web pages and they grew as time passed. Now I've decided to combine all those pages into a single booklet which can be downloaded and read at your leisure. If you use my information you can create a HUGE increase in "traffic" (visitors) to your web site after only a few months - maybe even sooner. Please note: This book is NOT free unless I've offered it to you as part of a package. (I use Claris Home Page which inserts these comments for its own use. >text links on the side and top of each page? Once you have enticed visitors to your web site, it's a good idea to keep them there for a while - especially if your purpose is to sell them something! There are lots of ways to design a web page to make it look attractive. 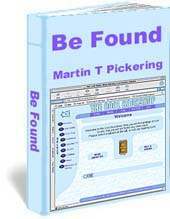 Martin Pickering is a mail order specialist, web site dabbler and lateral thinker, aged 49. He's been around long enough to know his limitations but not long enough to lose the excitement of learning.